Your use of this website is governed by these terms and conditions. Please take a few minutes to review these terms and conditions. Your use of the SmartSeatDiningChairCovers.com website constitutes your agreement to follow these rules and to be bound by them. If you do not agree with any of these terms and conditions, do not use the SmartSeatDiningChairCovers.com website. pb&j Discoveries reserves the right to update or modify these terms and conditions at any time without prior notice. 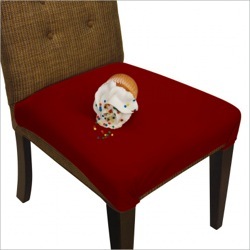 Your use of the SmartSeatDiningChairCovers.com website following any such change constitutes your agreement to follow and be bound by the terms and conditions as changed. For this reason, we encourage you to review these terms and conditions each time you use this website. The SmartSeatDiningChairCovers.com website is for the sole use of individuals and entities wishing to review, consider, purchase or otherwise engage in retail transactions involving pb&j Discoveries’ goods and services and/or to otherwise transact business with or contact pb&j Discoveries, on their own behalf (or, in the case of a gift or a corporate transaction, on behalf of their intended recipients). No information concerning the transactional preferences of an individual customer (whether such customer is a person or an entity) can be entered, altered, modified or otherwise affected, by any third party on behalf of such individual customer. In particular, pb&j Discoveries expressly prohibits third parties from opting out of pb&j Discoveries’ services and/or contacts on behalf of a pb&j Discoveries customer or other person or entity, without both (a) pb&j Discoveries’ full knowledge as to the surrogate action being taken and (b) pb&j Discoveries’ express permission. This prohibition is intended to protect the privacy and freedom of pb&j Discoveries’ customers and the personal relationship pb&j Discoveries works to develop with its customers and others authorized to use its site. All of the content you see on this website, including, for example, but not limited to, all of the page headers, images, illustrations, graphics, audio clips, video clips, and text (referred to herein as the “Content”) is the exclusive property of pb&j Discoveries and/or is subject to trademark, service mark, trade dress, copyright and/or other intellectual property rights or licenses held by pb&j Discoveries. 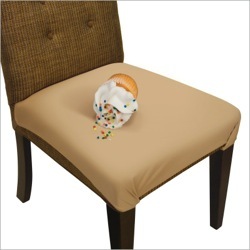 The Content of the SmartSeatDiningChairCovers.com website, and the website as a whole, is intended solely for the personal and non-commercial use of the users of our site. As such a user, you may download, print and store selected portions of the Content, but only if (1) you use any such copies of the Content only for your own personal and non-commercial use, (2) you do not copy or post the Content on any network computer or broadcast the Content in any media and/or in any form or format, (3) you do not modify or alter the Content in any way, or delete or change any copyright or trademark notice, and (4) you properly credit any intellectual property rights to pb&j Discoveries. No right, title or interest in any downloaded or copied materials are transferred to you as a result of any such downloading or copying. pb&j Discoveries reserves complete title and full intellectual property rights in any Content you download from this website. Except as noted above, you may not copy, download, reproduce, modify, publish, distribute, transmit, transfer or create derivative works from the Content without first obtaining the express written permission of pb&j Discoveries. We welcome your comments regarding the SmartSeatDiningChairCovers.com website. However, any comments, feedback, notes, messages, ideas, suggestions or other communications (collectively, “Comments”) sent to SmartSeatDiningChairCovers.com shall be and remain the exclusive property of pb&j Discoveries. Your submission of any such Comments shall constitute an assignment to pb&j Discoveries of all worldwide rights, titles and interests in all copyrights and other intellectual property rights in the Comments. Pb&j Discoveries will be entitled to use, reproduce, disclose, publish and distribute any material you submit for any purpose whatsoever, without restriction and without compensating you in any way. For this reason, we ask that you not send us any comments that you do not wish to assign to us, including any confidential information or any original creative materials such as stories, product ideas, computer code or original artwork. This site and all contents of this site are provided on an “as is” basis without warranties of any kind, either express or implied, including without limitation warranties of title or implied warranties of merchantability or fitness for a particular purpose. You acknowledge, by your use of this site, that your use of this site is at your sole risk, that you assume full responsibility for all costs associated with all necessary servicing or repairs of any equipment you use in connection with your use of our site, and that pb&j Discoveries shall not be liable for any damages of any kind related to your use of this site.